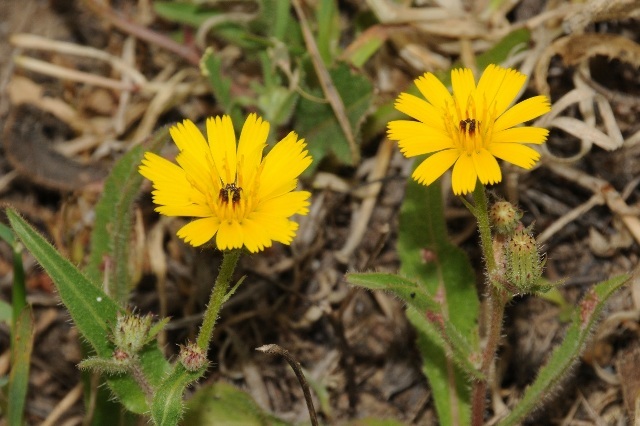 Picris willkommii is a member of the Asteraceae (Daisy) family, and as a non-botanist I would have likely overlooked it among the dwarf Pallensis spinosa and Corn Marigolds with which it was growing. The ICUN Red List of Threatened Species lists it as Endangered. P. willkommii is a south-west Iberia endemic with a very restricted range and is only known from two adjacent localities, one in the hills around Ayamonte, Huelva, Spain, the other just across the border in Portugal. We parked on the verge of the N122 just outside the built-up area of Castro Marim and walked into a field with scattered Almond trees. Immediately, we located several blooms, their dark centres readily distinguishing them, although it is their purplish-tipped sepals that are diagnostic. It was a sobering experience to be standing in an unexceptional field beside a main road staring at a small yellow ox-tongue, knowing its very existence is in the balance. Continuing urban development around Ayamonte threatens the plant’s survival in the wild, while overgrazing is a further hazard. Studies in Spain, where it may already be extinct, could result in the species’ status being upgraded to Critically Endangered (Valdés & Caldas 2011). Reference: Valdés, B. & Caldas, F.B. 2011. Picris willkommii. The ICUN Red List of Threatened Species. 2011. Pyramidal Orchids Anacamptis pyramidalis are usually pink but occasionally white specimens will be found amongst the pink flowers. 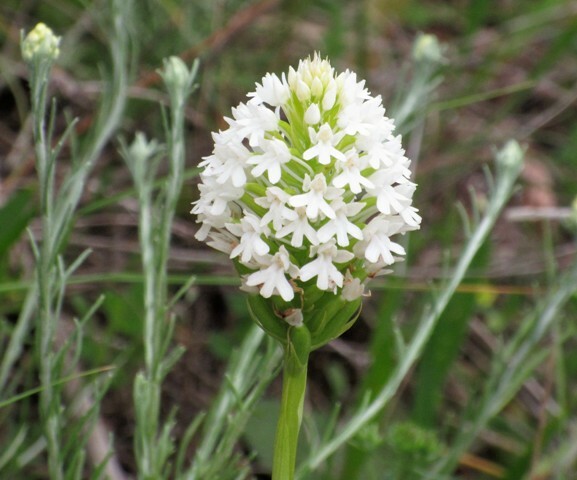 Pyramidal Orchids are common and widespread throughout the Algarve and can occur in large colonies from the end of March onwards. The Champagne Orchid Anacamptis morio subsp. 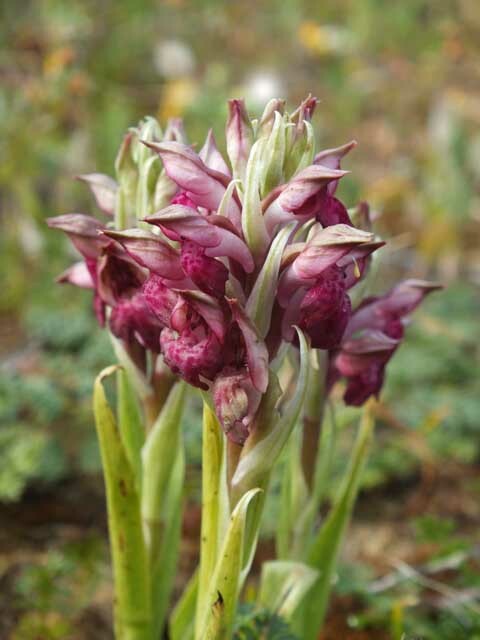 champagneuxii is sometimes found within groups of Green-winged Orchids Anacamptis morio but are a relatively rare find. The main distinguishing feature is the pure white patch on the lip. 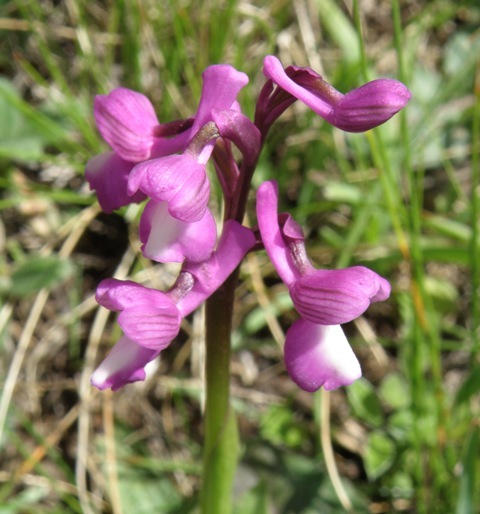 Ordinary Green-winged Orchids have dark pink markings in the centre of the flower-lip. Our books and website on the subject of wildlife in the Algarve always gives us special impetus to try and find different and unusual things to photograph or report, and thanks to our network of wildlife enthusiasts throughout the region, we are seldom short of content. 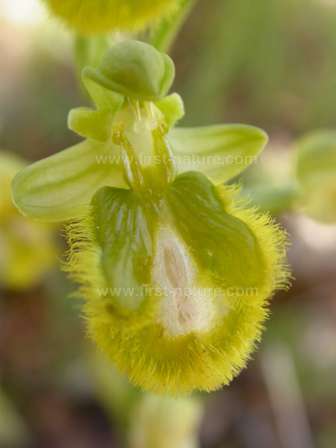 Pictured above is a hybrid between the Mirror Orchid and the Sawfly Orchid. 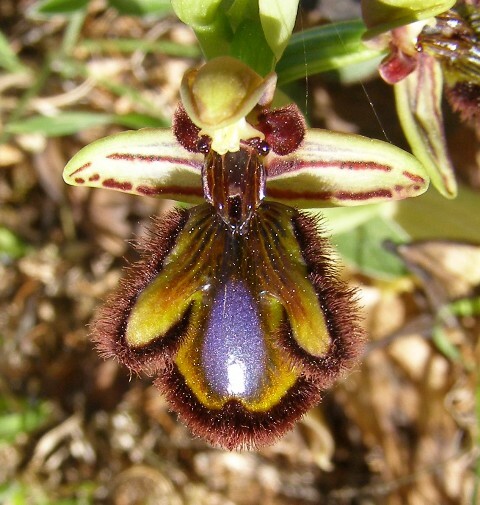 A spring ritual, photographed above, is a trip out to the western Algarve (Val de Telha) to check on a recently discovered (by Carla Cabrita Walkin'Sagres...) colony of Bug Orchids which are very localised in the remainder of the Algarve. From time to time orchids lacking their normal colours will appear as a result of genetic abnormalities. This condition can affect the whole plant, the flowers or sometimes just part of the flowers. When all the red and blue pigments (anthocyanins) are blocked, the resulting flowers will appear completely white, green or yellow as in the case of this Mirror Orchid Ophrys speculum photographed at Boca do Rio on 1st April. The lack of anthocyanins allows the anthoxanthan (white to yellow) pigments and chlorophyll in the flowers to become dominant. 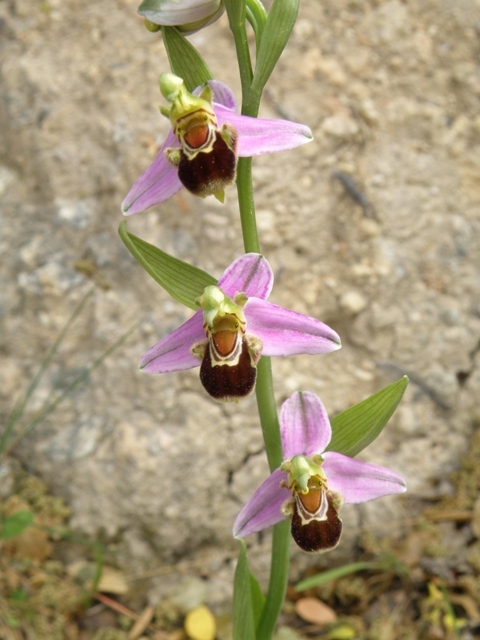 The reverse condition, hyperchomy, can also appear in orchid populations and this results in very dark, strong coloured flowers. 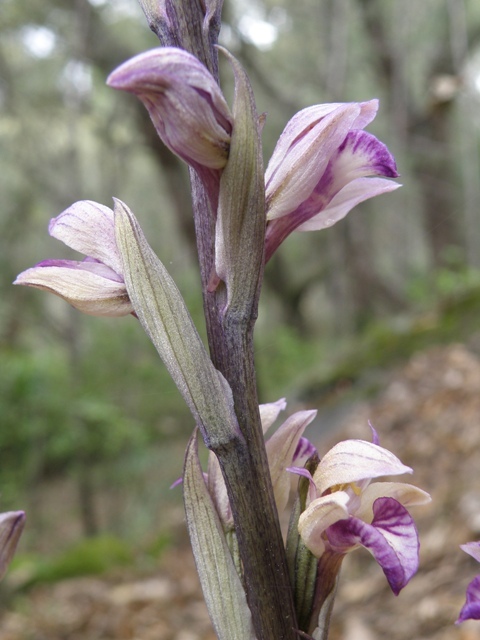 Above - the Naked Man Orchid Orchis italica is one of the more common orchids in the Algarve and occurs throughout the area. 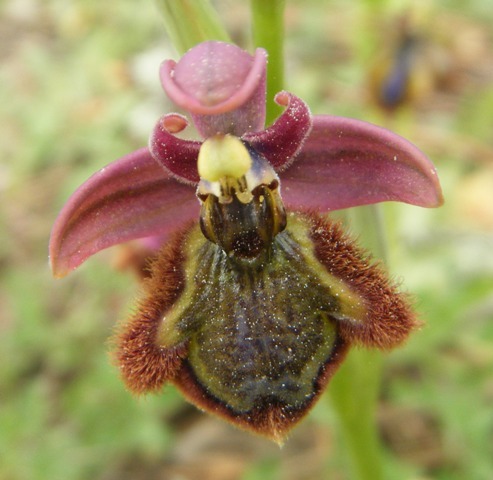 Above - the Bee Orchid Ophrys apifera flowers in late April and May. It is found throughout the Algarve but is localised. 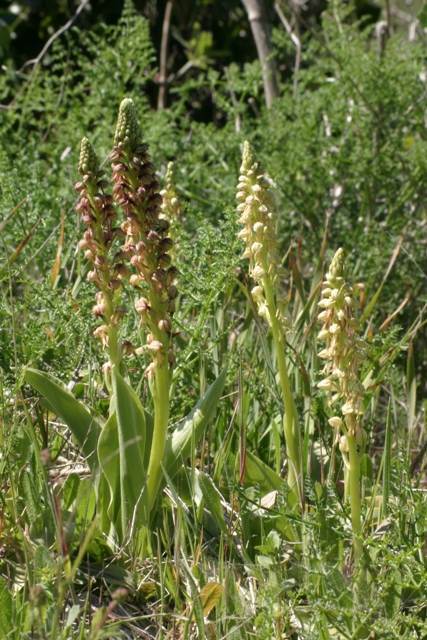 The Man Orchid Orchis anthropophora is widespread but very localised in the Algarve. The particularly robust plants shown above were found close to the coast a Boca do Ria. Violet Limodore Limodorum abortivum is rare and only known from a few small areas of Cork Oak and Pine woodlands in the hilly areas. 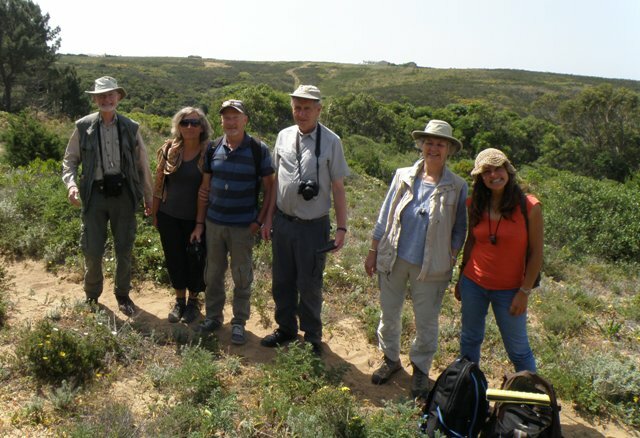 This is the time of year to see some of the most interesting and rare plants that grow in the Algarve. Cynomorium coccineum, often referred to as the ‘Maltese fungus’, is a rare and poorly understood parasitic flowering plant. 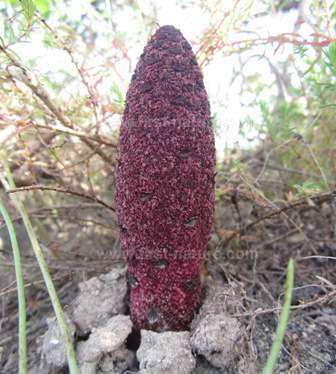 The plant is very distinctive and has a blackish-red infloresence which bursts up through the earth from an extensive underground rhizome system. Cynomorium coccineum has no green pigment and is unable to synthesise (make from sunlight) its own food. It steals its nutrients from the roots of other plants. 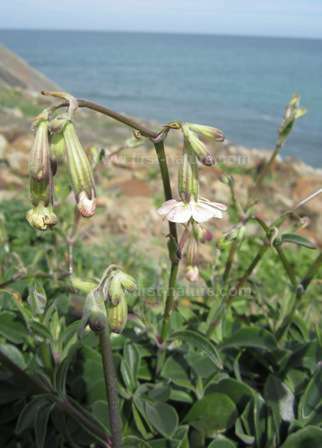 Silene rothmaleri is an extremely rare endemic of the southwest coast of Portugal, where its occupancy is less than 400 km2, and less than 3,500 individuals are believed to exist. The species was first collected in 1945. Officially described in 1956 but never collected again, it was therefore believed to be extinct by most botanists. 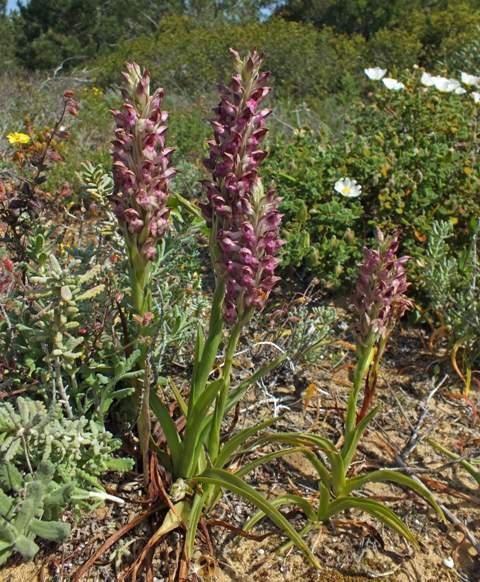 In fact S. rothmaleri still occurs on a few remote shale slopes in the Cape St. Vincent area (where it is legally protected), and the authors of Field Guide to the Wildflowers of the Algarve, Chris Thorogood and Simon Hiscock, have observed the plant in flower most years in the last decade. The book was launched in April 2014 in the Algarve. Below: Portuguese Sundew with its pretty yellow flower. Picture by kind permission of Ron Porley. This carniverous plant is Portugal's equivalent of Round-leaved Sundew Drosera rotundifolia which is found in the more northerly parts of Europe, but rather than living in acid bogs and marshes, Drosophyllum lusitanicum makes its home in dry chalky and stony ground. 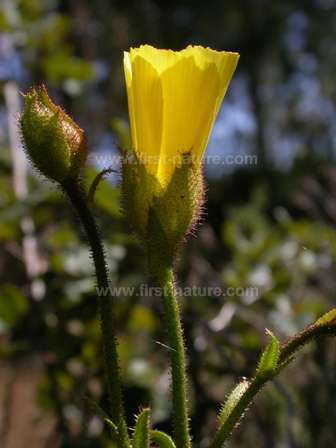 Its flower is bright yellow and much more attractive than the diminutive white flowers on other sundews. Portuguese Sundew is extremely rare and is disappearing from many of its formerly-known stations due to habitat loss and collecting by carniverous plant nuts. Today it is (probably) only found in a few remote areas in the far west of the Algarve. It is also recorded from Spain and Morocco but Portugal has traditionally been its stronghold and there is an ongoing conservation programme to try to restore the plant to some of its previous locations. Like other sundews Drosophyllum lusitanicum exudes a sticky substance from its stems and leaves which traps small insects and kills them. They are then digested by enzymes which occur in the leaves of the plant. April and early May is the ideal time to see one of the Algarve's truly iconic birds as they arrive from wintering grounds ready for the breeding season. These brilliantly coloured birds make their nests in the earth banks of salt pans. 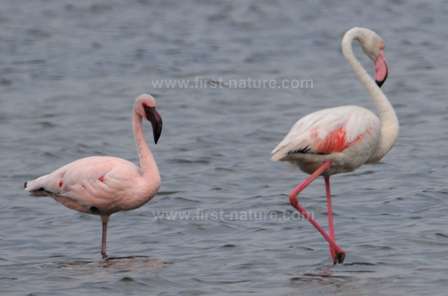 The Algarve is a good place to see Flamingos and several areas play host to their gatherings. Castro Marim Nature Reserve, Ria Alvor estuary and Salgados are all worth a visit to see these magnificent birds. June - Pincushions and Fritillaries. Clive Viney pays homage to an Algarve star. 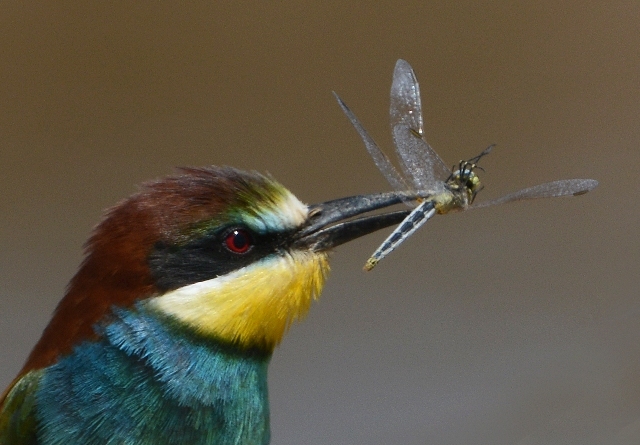 Late May and early June would seem to offer few opportunities to see the best of Algarve’s wildlife. 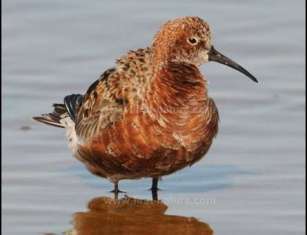 Many birds have finished breeding and migrants travelling north have moved on. The wildflower show that was so good in March and April is all but over. Rain has become a memory and long summer days have arrived. The countryside is edging from green to brown and the beach and swimming pool beckon. But it is still not too hot to discourage a country walk to enjoy the scenery and see just what is about. The surprise will be butterflies and the place to look for these is where wildflowers are still in bloom and the good news is that butterflies are more active during the middle of a sunny day. Early morning starts are unnecessary. Scabiosa stellata is as the name suggests a species of scabious. It is distinguished not so much by its pale lilac or white flowers but by the round papery cups that are left when the flowers fall. Although a native of southwest Europe it has become an ornamental plant and thereby attracted a number of English names including starflower pincushions, drumstick scabious and moonflower. In the Algarve it is a native wildflower and blooms in late May and early June. It is an insect magnet and especially attractive to butterflies. Above: Spotted Fritillary on Scabiosa stellata. Picture Clive Viney. Inland from Tavira the Alportel River winds its way through lovely hills down to the sea. For part of its journey a riverside track follows the valley and with its gentle inclines makes a perfect early summer walk. River pools burst with life and a passing golden oriole or bee-eater can take the breath away. In one place Scabiosa stellata grows alongside the track for just fifty metres or so. Last week I photographed no fewer than 15 species of butterflies on these plants. The flowers must be intoxicating because the butterflies just gave themselves up. 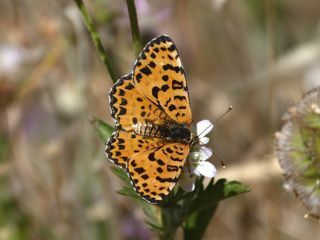 Among the species were Spotted Fritillaries and Chapman’s Blues, which are rarely seen in the Eastern Algarve. It also provided a wonderful opportunity to study our little known skippers – small moth-like butterflies. Before my walk was finished I added another ten butterfly species, unfortunately not so intoxicated. I would love to have photographed an exotic Two-tailed Pasha but they just flew by. As April progresses more and more of the wildflowers of the region are bursting into bloom, and with them come the insects who depend upon the nectar on offer by the flowers in exchange for the part the insects play in pollination. 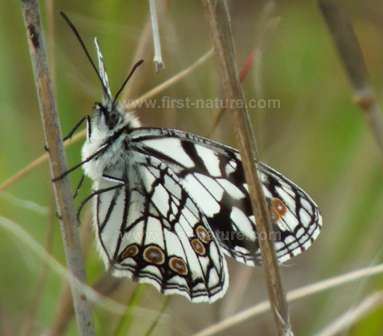 We have already seen several of the gorgeous butterflies that make their homes in the Algarve - Spanish Festoon, Swallowtail, Cleopatra, Red Admiral and Speckled Wood to name but a few.